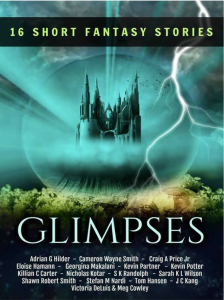 Glimpses is a FREE collection of 16 short fantasy stories. Each story gives a glimpse into a fantasy world and also acts as an introduction to that author’s writing – you never know, you might find your next favourite author here. I’m a city guy, born and raised, but I’d seen more than my fair share of the world. My home was in the heart of Camden, a stone’s throw from the Regent’s Canal, surrounded by the hustle and bustle of London life. If my roots lay anywhere, it was there. Where the streets are lined with urban street art, and a punk mentality permeates the air, along with the appetising smells and constant cawing of traders in Camden market. A far cry from my current surroundings. The wind screamed as a sand storm shrouded the sky and turned day into night. The once calm waters of the Nile rose in towering crests. Sand, wind, and an icy spray battered my fishing boat and tossed it around like flotsam. My heart pounded and my skin felt stripped raw. I checked my bearings and steered the boat starboard. I had to be close, but the forbidding storm had consumed sky, land, and water with a sandy blizzard. The boat juddered to a halt and sent me tumbling to the deck. At last, I’d run aground. A sensible man would have hunkered down, ridden out the storm, but no-one had ever called me sensible, and besides, I was one of the Magicai. Whether reckless behaviour came with magical powers, or it was just part of my innate nature, who was to say, but one thing was for sure, I had an advantage over most men in this cruel environment. Ordinaries, we called them, people with no magical power. Most of whom lived their lives unaware of the magic around them. I clutched at the rune stone on a leather cord at my neck. It thrummed, acting like a conduit and drawing on the energy of the ley lines to infuse me with magic. The Eye of Horus, etched in the stone, flashed as I called upon its power to shield me from the worst of the elements and guide me through the storm. I spat out the sand lodged in my mouth and launched myself into the onslaught. Protected by a magical shield, the sand no longer flayed my skin, and the incessant roar of wind was a murmur. I trudged over the inhospitable terrain, following the pull of my rune stone. The power calling me intensified as I neared the convergence of ley lines: a potent beacon of energy in the distance. After a while, the sand blew away, the winds abated, and the storm cleared. I dropped my shield as the remains of an ancient city rose before me. The Nubian Pyramids of Meroë. My path wound between the dunes and through the crypt-quiet city. Neither man nor beast moved around me, not even a scorpion scuttled along the sand. The only sign of the once raging storm was a deathly stillness to the air. My throat was as dry as the desert. The sun beat down from a clear sky, stabbing me with spears of heat and covering the landscape in a haze that blurred my vision. I pulled a canteen from my backpack and savoured the water as it moistened my mouth and slid down my throat. With my senses on high alert, I approached the final structure and stood in the doorway of the weather-worn pyramid. Something moved inside. A glimmer of light burned like liquid fire. I took a deep breath, ducked beneath an overhanging beam, and entered. The heat followed me inside, where stale air clogged my lungs and hieroglyphics lined the walls. I wiped the sweat from my brow and slid between a narrow opening. A dark figure moved in front of me, silhouetted like a shadow in the gloom. It reached towards me, its hand outstretched, beckoning me forward. In ancient times, the Egyptians believed the Nile was a supernatural source, a place from the netherworld that crossed the boundaries between worlds. In many ways they were right. Hidden at the points where ley lines converged, doorways to alternate realities existed. The Pyramids of Meroë, like many ancient landmarks, were built on such a convergence. Every Magicai knew the source of their power, but not every Magicai knew the secret of the doorways. I was one of the Travellers, and like my father before me, I crossed between worlds, exploring different realities. I’d only just arrived back in London, after an otherworldly expedition, when Skylar had entered my world from his and sent a magical summons. That was the big difference between Skylar’s world and my own. Firstly, the Great War referred to a war in a different time and place. Secondly, where Egypt succumbed to the Romans in my world, and the Nubian empire faded and disappeared along with their trade routes, in Skylar’s, the Romans were defeated and the Nubian empire flourished to his present day. “What makes you think it’s here?” I asked. I winced. Magical artefacts should never be joined with their counterparts in other worlds. The results would be… well, I wouldn’t want to be around to find out. Suffice to say, big bad magic equals big bad danger. “That’s not good,” I said. 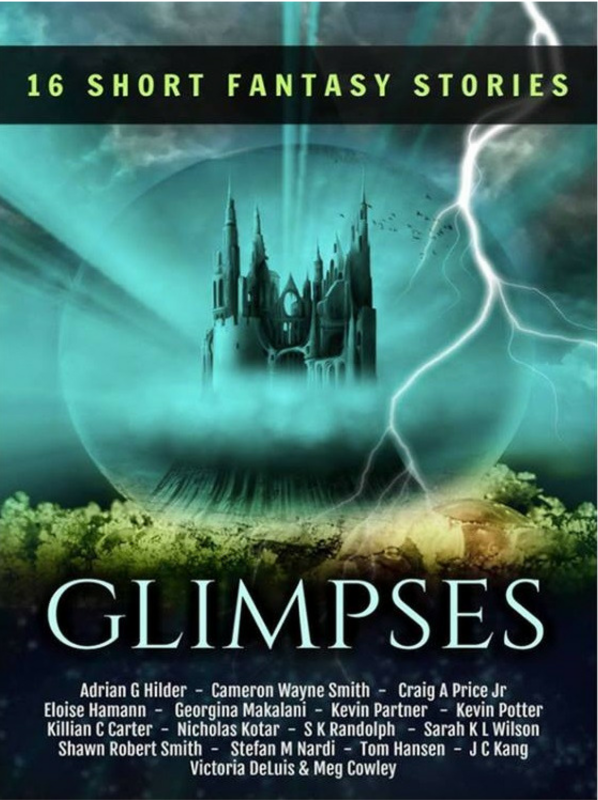 Glimpses is available for FREE for a short time only, so grab your copy now!